Adapting a series onto another series may look like a very easy process, but it is not. Weather it is a book series, a television series, a comic series, a manga series, an anime series, a light novel or what so ever series it is, adaptation has always been a rumble talk for every series enthusiast. It is like transforming energy. Whenever energy is transformed, there is always heat (transformed heat) in the process, which leaves a fewer amount amount of energy (transformed energy) to be used. The majority of energy becomes heat and the more process/transformation the energy takes place the lesser and lesser it will produce. Please excuse me for talking like a Science teacher. 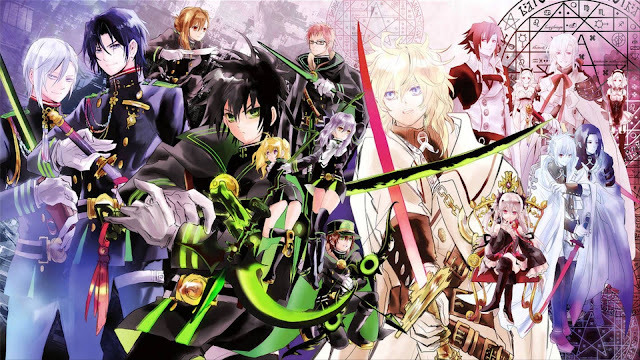 Before any kind of bashing comes online, I would like to state that I am not a hater of Seraph of the End's anime adaptation. To be honest, I am a fan of the original manga of this franchise. It even drove me to buy the light novels of it which made me love the franchise even more but the anime adaptation is so disappointing. I am disappointed that the story telling on the second season was not for every anime enthusiast, that even if you watched the first season you'll end up getting dizzy until the end of every episodes. It was like how the energy being transformed that I was talking about. My true love to the franchise kinda had a heart break, yet still never giving up.